Bitto DOP - 500 gr. Bitto DOP - 1 kg. Bitto cheese has remote origins which are rooted in the Alpine area of Valli del Bitto di Albaredo and Gerola, right in the heart of the Parco delle Orobie Valtellinesi. In year 2000 it was awarded the certificate of Appéllation d'Origin Protégée by the European Community. It is fat, middle-hard, middle-ripe, Alp cheese. Its cylindrical cheeses are 40-50 cm in diameter, 9-12 cm high and weigh from 9 to 20 kg. Its colour varies from white to straw-yellow according to ripe. The producing process covers a period of 4 months - from the 1st June to the 30th September - and fully respects the tradition and the environment. At the beginning of its ripening process its taste is sweet and delicate. After the first year it develops a sharper and richer flavour, its nobility increases, becoming finally an excellent product to be found on the most refined tables. Nutritional facts per 100 g:. The Valtellina Casera DOP is made up of partially skimmed cow's milk coming from 2 or more milkings. 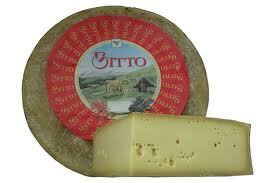 Together with the Bitto DOP it is among the most known and appreciated cheeses in Lombardy. It has cylindric shape and it weights from 7 to 12 kg, its crust is straw yellow coloured, its paste has compact structure and presents thin and spread holes. Depending from the aging the colour of the paste varies from white to yellow. 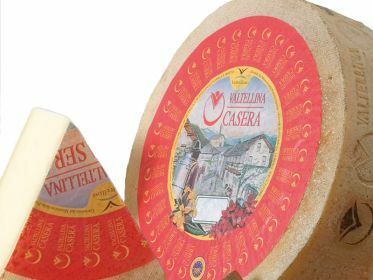 The Valtellina Casera DOP is a sweet taste cheese endowed with the characteristic taste of milk and a shade of dried fruit that becomes more intense with the aging; it is great as a main food or grated as well if it is well aged. It is a fundamental ingredient for the traditional Valtellina's Pizzoccheri, the Cornmeal Mush with cheeses and for the Sciatt eil Taroz. 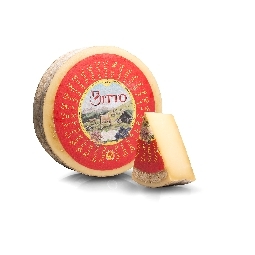 BITTO DOP "Alpine milk and nature"
The Bitto cheese is made exclusively from milk that is milked from cows that graze on the pastures in the province of Sondrio and some communities of Alta Valle Brembana and the province of Lecco. The production time begins on June 1st and ends on September 30th.